With straight needles, CO 86 sts. Begin pattern and work for 10″ or desired length. BO 4 sts at the beg of the next 2 rows. Keeping to pat, dec 1 st at each end every other row 3 times (72 sts). Work until armhole is 10″ or until desired length. BO 8 sts at the beg of the next 4 rows. With straight needles, CO 44 sts. Begin pattern and work for 10″ or until desired length. At armhole, BO 4 sts. Work until armhole is 7.5″ or until desired length. With straight needles, CO 37 sts. Keeping to pattern, inc 1 st every 10th row 7 times – 51 sts. Work 17.5″ or to desired length. BO 4 sts beg next two rows – 43 sts. Keeping to pattern, dec 1 st at each end every 4th row 13 times – 17 sts. 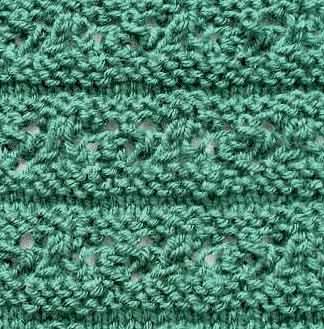 With circular needles, pick up stitches for band from the left edge of the garter stitch bottom border to neckline. Knit stitches from holder. Pick up stitches from neckline to bottom border for remainder of the band. Please see Picking Up Stitches For Necklines And Armholes for more information. Sew in sleeves. Seam sleeve and side seams. Weave in ends on WS. K1 b Insert needle through center of stitch 1 row below next stitch and knit, slipping stitch above off needle at the same time. Rep this row for pattern. CO 265 sts. Work 15 rows in Seed Stitch. Work first 15 sts in Seed Stitch, place marker, work Bee Stitch over next 235 sts, place marker, work last 15 sts in Seed Stitch. Continue until afghan measures 73″ or desired length. Work 15 rows in Seed Stitch.